BloggersMNBloggerBash, Good Things, and what’s inside this bag? MNBloggerBash kept great communication through all of their social media hookups to alert attendees of any event changes (like the first major winter storm). This was helpful for me as I am across the board working with various clients of all design natures, constantly keeping up with my FB/Twitter newsfeeds for the latest global information, and I am a skimmer when it comes to reading! The only major change was the date due to the weather. I adjusted my normal schedule to go and everything stayed aligned! So being back in my old stomping grounds from my college days, I know my general way around Maple Grove and ALL of the shopping districts it offers…..but….I for the life of me, with my trusty iPhone maps app, could NOT locate Good Things! Sooo – I took to twitter 15 minutes before the event started (because I do NOT like to be late), and <3’d the quick response! @EricaSchaaf1 behind trader joes, across the street from the gap. I did find it with that one key store that also starts with a “G” 😉 NOW for the fun part! Good Things is a specialty store with locations in Maple Grove and Woodbury, MN. They have been in existence since 1973. Good Things sells everything possible for various areas for the home along with fun gag, specialty gifts for friends & family. I immediately was drawn in visually ~ like there isn’t any white or empty space, so you are ALWAYS finding something new to look at and check out even though you had been in that same area at least 5x’s already. My favorite spots in the store were the Wine and Spirits, Home Decor, Cooking and Baking, and Gag gifts. They have more though, such as fun clothing items (socks, women’s tops, etc.) and other fun things for everyone to enjoy such as the Horse Head Squirrel Feeder! I did NOT want to leave this store…. Ok – NOW to the actual event details! Zio Cucina Bar @ZioCucina (Twitter & Instagram) who provided a Ravioli Dish, Marinara Pasta Dish, Salads and bread. Burger Burger @EatBurgerBurger (Twitter & Instagram) who provided various burgers (each with different names) and fries along with signature sauces. Vom Fass @VomFassmg (Twitter & Instagram) who provided Red & White wines, along with Brandy & Coffee Liqour shots. All of the food and beverages were insanely delicious!! I highly recommend visiting these establishments :). I wish I had taken pictures – but others did, and you can totally check out their shots on Twitter and Facebook! Good Things gave away prizes throughout the evening. They gave away items that are sold in their store which included a fun twist to a Minnesota themed puzzle, fun gag socks, a cool water bottle (keeps temperature or hot/cold drinks forever, an iLoom, and other great items. 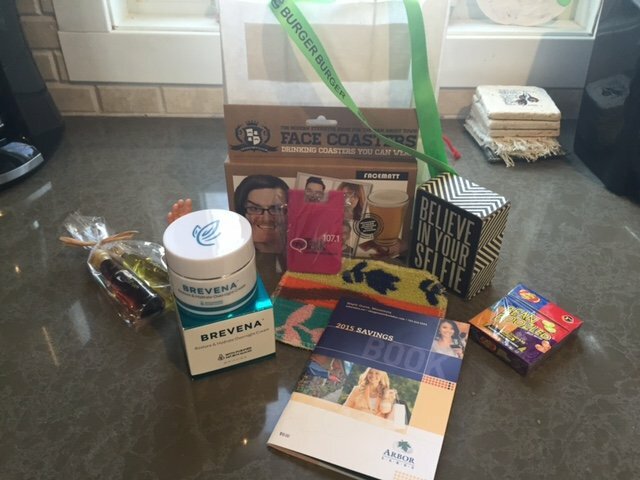 Brevena Night Cream (worth $89), Oils from Vom Fass, fun specialty items from Good Things, a MyTalk107 radio station business card holder, and a coupon book towards the Shoppes at Arbor Lakes, Maple Grove MN. WOW!!!! I have yet to try the Brevena night cream and oils, but we have had fun using all of the other items! Overall, I think there were at least 20-30 (guesstimate) in attendance for this event – with most being female, but a few males also. The blogs they write range from Mommy Bloggers to DIY to whatever their business is. With this event being my first, I tend to be a little shy and spent most of my time looking at all of the fun products, however….the silence broke when I connected with Amy Zellmer, Author of “Life with a Traumatic Brain Injury” along with being a strong advocate for TBI Awareness, Photographer, and Business Coach. I first came to know her at a Help-Portrait event in Minneapolis about 4 years ago, and have stayed connected with her through social media, but have never really gotten to know her. We were both newbies, so to meet new people at the event was our mutual goal! Another person that I also met was Jenna Redfield who I heard speak on “Youtube Basics for Bloggers” at MNBlogCon. She is an entrepenuer in creating visuals for bloggers in both stock photography and videography. She also blogs! If you are a blogger reading this post, I highly recommend checking out her work for your future posts! There were a few more bloggers (DYI) that I exchanged business cards with and connected briefly. Some are new and getting into the world of blogging. If you have my 3S Design business card, and am interested in connecting more about any social media marketing from your site, or any design (print & web) for your blogging business or platform, please get in touch! My contact information is slapped all over this website ;). IF you decide to visit the rest of our website, we have been in existence since 2008 as just being a web design/host company. In 2012, we expanded to graphic design and became a WordPress website design shop. We currently have 30 host clients with additional non-website clients for other design needs. We host and manage WordPress websites besides designing them and give consultations on blogging in general. If you are looking for a web team to work with you on the backend (and frontend) of your blogsite, totally connect with us and ask us about our Referral Program (for host clients only). Back to the main point of this post, I hope to be invited to more MNBloggerbash events so I can continue networking from both avenues of Blogsite designer (for those bloggers who aren’t sure how to design their overall site) and also blog about my work (in order to attract bloggers for any branding, other designs, etc.). I have a few blog posts of past projects in the works, and will hopefully publish BEFORE 2016 arrives! Finally, a HUGE Thank You to those who organize these monthly meetings. Being an organizer myself for various non-profit org’s, I know the work and connecting it takes to make these events happen! I hope to meet you at future events! PreviousClient Promo Video ~ Nicole Junker, Realtor.